That’s what Stone Sour Lead Singer Corey Taylor told “Rock Show” on BBC Radio 1 about the band’s latest album, “Hydrograd”. “Hydrograd” is the follow-up album to the double album “House of Gold & Bones” which was released in 2012 and 2013. The band also released two Eps of cover songs in the last couple years, “Meanwhile in Burbank…” and “Straight out of Burbank”. The new album is tentatively due out this summer. 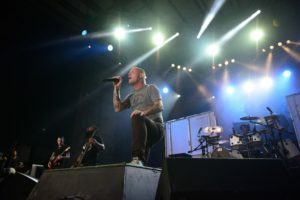 Stone Sour is also set to hit the road this summer as they stop in Cadott, WI to play Rock Fest. They last played the festival in 2014. This year, they’ll join headliners Avenged Sevenfold, Rob Zombie, and Slayer.